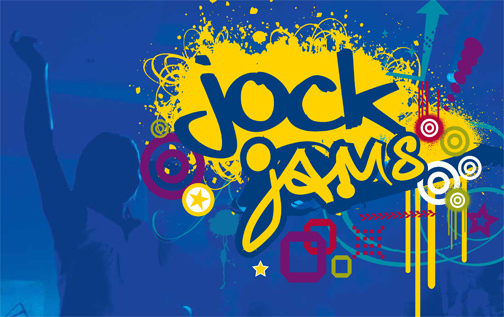 The University of Toledo Student Athlete Advisory Committee will host its third annual “Jock Jams” talent show Monday, April 1, at 7:30 p.m. in Savage Arena. UT student-athletes will showcase their talents off the field of play. Each UT sport will have an act. Before each act, a coach from each sport will introduce the act and also recognize the team’s seniors. Tickets — $5 for the public and $2 for students — can be purchased at the UT Ticket Office in Savage Arena or on the night of the show. Dr. Andrew Mattison, associate professor of English, has a passion for poetry and is especially excited when he gets the chance to teach his students some of his favorite works, such as those of John Milton. 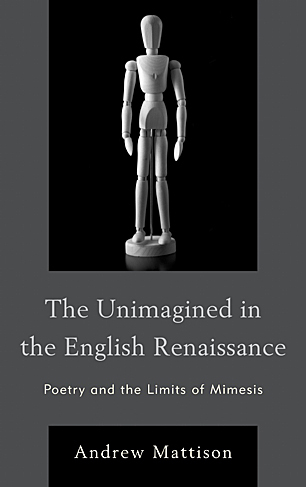 Mattison believes in many respects that his research and teaching are united, as he shows in his latest book, The Unimagined in English Renaissance: Poetry and the Limits of Mimesis, in which he seeks to expand on questions raised in the classroom. Published by Fairleigh Dickinson University Press, the book focuses on description and imagery in Renaissance poetry, but according to Mattison, not on descriptions that present a vivid image to the reader’s mind, but on those that seem to avoid doing so. The book focuses on the work of poets Edmund Spenser, John Donne, Philip Sidney and Milton, and follows a 100-year period, from 1575 when Sidney entered the court of Elizabeth I to the death of Milton in 1674. English poetry of the Renaissance is of special interest to Mattison because poets of the era were keenly interested in literary representation. The Unimagined in English Renaissance picks up where his 2007 book, Milton’s Uncertain Eden, left off. The course he teaches on Milton is his favorite class, and just as in his first book, he builds much of his consensus around Milton’s Paradise Lost, an epic poem originally published in 1667 in 10 books and later re-published in 12 books. The Unimagined in English Renaissance: Poetry and the Limits of Mimesis is available in Carlson Library and for sale online and at the Barnes & Noble University Bookstore. The yearly philanthropic 13-hour bash formerly known as UT Dance Marathon got a makeover, which includes a new name. Dubbed RockeTHON, this year’s dance marathon will be held from 10 a.m. to 11 p.m. Saturday, April 20, in the Student Recreation Center. The event is going to be more aggressively promoted through Facebook and Twitter. The goal is to have about 1,000 people compete and raise $100,000. Besides the name, the color scheme for RockeTHON has been changed from blue and gold to lime green, so it “doesn’t get lost in the crowd,” according to Price Murphy, RockeTHON director. All money raised is donated to the Children’s Miracle Network, which disperses the proceeds locally to Mercy Children’s Hospital. To make students realize the importance of the event, 23 families will share their miracle stories. This year’s activities will include live entertainment by local bands Halero and Clark and Danko. There also will be an obstacle course for teams composed of student organization members to compete for “spirit points,” and there will be special prizes for those who accrue the most points at the end of the night. And there will be a dance lesson each hour. The theme of this year’s RockeTHON will be “America in 13 hours,” with sub-themes for different events: Wild West, military, rave and Hawaiian beach. The deadline to register for RockeTHON is midnight Saturday, April 6. 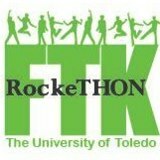 Students with inquiries can reach Murphy at price.murphy@rockets.utoledo.edu or check out Facebook.com/RockeTHON. Sophomore guard Inma Zanoguera led the Rockets with 13 points. Toledo’s run in the WNIT came to an end with a 63-55 loss to Illinois Thursday in the Sweet 16 before 3,410 fans in Savage Arena. The 2012-13 Mid-American Conference Regular-Season Champion Rockets tied the school record with a 29-4 overall mark and closed out the home campaign with an impressive 15-2 ledger. In a battle between two of the nation’s top defenses, the Illini (19-13) were able to convert key field goals down the stretch; this included a three-pointer from Amber Brown that banked off the glass as the guard was falling backwards with 3:16 left in regulation. That trey gave the visitors a 55-49 lead and momentum that resulted in a 12-4 run to close the game. Sophomore guard Inma Zanoguera scored two field goals in the final minute of regulation to trim the deficit to five, but that was the closest UT could get. The two teams exchanged the lead four times and tied the score on seven occasions. The Rockets fell victim to 23 turnovers that were converted into 20 points for the Illini. The Midnight Blue and Gold shot 35.3 percent (24 of 68) from the field, including 21.1 percent (4 of 19) from three-point range, and 75.0 percent (3 of 4) from the free-throw line to fall to 0-3 vs. Big Ten schools in the WNIT. Zanoguera paced the Rockets’ attack with 13 points, six boards, three steals and three assists in a career-high 40 minutes. Senior Yolanda Richardson notched 12 points after a perfect six-for-six shooting effort and grabbed four boards. The MAC leader in overall field-goal percentage ended the season shooting 58.6 percent (146 of 249), tied for fifth best in school history. Senior Naama Shafir and junior Andola Dortch chipped in 10 points each, but UT’s top scorers went a combined 8 of 33 (24.2 percent) from the field and could not find their rhythm. Shafir added a season-tying best eight rebounds with a team-high six dimes. Dortch finished with five helpers and a rebound shy of a double-double with nine caroms. 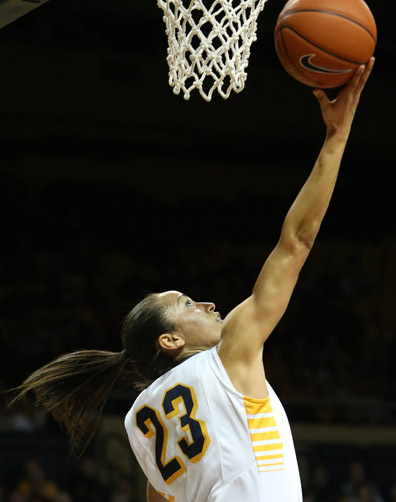 UT out-muscled the visitors on the glass, 47-40, led by senior Lecretia Smith’s contest-tying best 11 rebounds. Junior Brianna Jones also ended with three points and five rebounds against her former team. Illinois shot 33.3 percent (20 of 60) for the game, led by Karisma Penn’s double-double performance with a game-high 23 points and 11 boards. Brown contributed 18 points and torched the Rockets with five treys on 50.0 percent (5 of 10) shooting from beyond the arc. The thoughts and prayers of UT community members are with UT Police Officer Jeni Gerber, whose daughter, Kaitlin, was shot and killed March 24. A fund in Kaitlin’s name has been established to support the family at The University of Toledo Federal Credit Union. Those with credit union accounts can call and transfer money to the fund by phone. Those without accounts can bring cash to one of the credit union’s three branches and ask that the amount be added to the fund. The credit union branches are located at 5248 Hill Ave. in Toledo, Mulford Library Room 013E on Health Science Campus, and Student Union Room 3019 on Main Campus. Phone numbers and hours of operation are available at http://www.uoftfcu.com. UT Police Chief Jeff Newton said the department has been quick to rally behind Jeni, an officer at UT since 2000, and her family. UT Women’s Basketball Coach Tricia Cullop has been named the Russell Athletic/Women’s Basketball Coaches Association (WBCA) Region 4 Coach of the Year. Coach Tricia Cullop and the Rockets celebrated after a big win. Cullop earns the regional honor for the first time in her coaching career and is a finalist for the WBCA National Coach of the Year award. The other NCAA Division I regional winners and national coach of the year finalists are Muffet McGraw (Notre Dame, Region 1), Brenda Frese (Maryland, Region 2), Holly Warlick (Tennessee, Region 3), Kim Mulkey (Baylor, Region 5), Coquese Washington (Penn State, Region 6), Beth Burns (San Diego State, Region 7) and Tara VanDerveer (Stanford, Region 8). The 2013 Russell Athletic /WBCA NCAA Division I National Coach of the Year will be named during the third annual WBCA Awards Show Monday, April 8, in New Orleans. The event is part of the WBCA National Convention and is held in conjunction with the NCAA Women’s Final Four. Cullop has guided the Rockets to a 29-3 overall mark this season for their best mark in school history, including a 15-1 Mid-American Conference ledger. 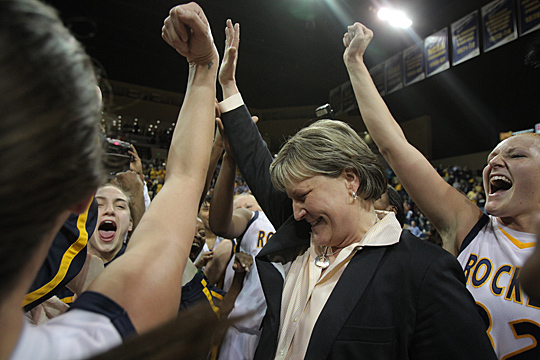 Toledo also captured its second MAC Regular-Season Championship in the last three years, as well as secured a berth in the WNIT for a fourth consecutive season. Toledo’s 15-1 conference record signified the third time in school history it posted a .938 win percentage (2000-01, 1991-92). The Rockets’ 29 wins are tied for the most in school history and tied for second most in the MAC record books. UT also has cracked the Top 25 for the first time in more than a decade. The Rockets sat at No. 25 in the Associated Press media poll with 64 total points for the week of March 4-10. The last time UT was in the Top 25 occurred during the week of Nov. 19-25, 2001, when it stood at No. 24 in the AP Poll after upsetting No. 4 Duke. For her efforts, Cullop collected MAC Coach of the Year recognition for a third time in her first five seasons, third highest total in league history. The Midnight Blue and Gold also has sported win streaks of 15 and 11 consecutive games this season, ranking in the top seven in school history. UT is one of just 13 programs in the country to win at least 24 games each of the last four seasons (records as of March 18). Toledo also paced the MAC in home attendance for a 23rd straight season with an average of 4,049 fans per contest, the second highest total in school history and the 20th best mark in the country. UT totaled a season high 5,712 fans vs. Kent State, signifying the fourth largest crowd in school history. Individually, a school record tying four Rockets earned spots on the All-MAC teams. Toledo placed senior Naama Shafir and junior Andola Dortch on the All-MAC first team, senior Yolanda Richardson on the second team, and sophomore Inma Zanoguera on the third team. UT’s total of four selections tied for the most in the conference with Central Michigan. Shafir also became the first Rocket ever to garner all-league accolades on four occasions. In addition, Shafir was selected as one of 52 regional finalists for the WBCA Coaches’ All-America Team for a second time in the last three seasons. Dortch also repeated as MAC Defensive Player of the Year, becoming the fourth player in league history to earn the top defensive award on more than one occasion. Cullop and the Rockets will entertain Big Ten member Illinois in the Sweet 16 of the WNIT Thursday, March 28, in Savage Arena. The opening tip is slated for 7 p.m.
On Tuesday, April 2, World Autism Day, you may notice University Hall’s bell tower and Mulford Library lit up blue. Major landmarks including the Pyramids of Giza and the Sydney Opera House also will be lit up blue to help raise awareness of autism. Alpha Xi Delta, a national sorority, and the University will work together in “Light It Up Blue,” an Autism Speaks program. Autism is a development disorder that is characterized, in varying degrees, by difficulties in social interaction, verbal and nonverbal communication, and repetitive behaviors. A new case is diagnosed every 20 minutes; this year, more children will be diagnosed with autism than with AIDS, diabetes and pediatric cancer combined, according to Autism Speaks. To get involved with “Light It Up Blue” or to learn more about Autism Speaks, contact Emily Jacobson at emily.jacobson2@rockets.utoledo.edu. Athletic training is not just about healing a sprained ankle or containing the pain enough so an athlete can compete; it also pertains to the preventative measures taken to avoid major injuries so they do not occur in the first place. 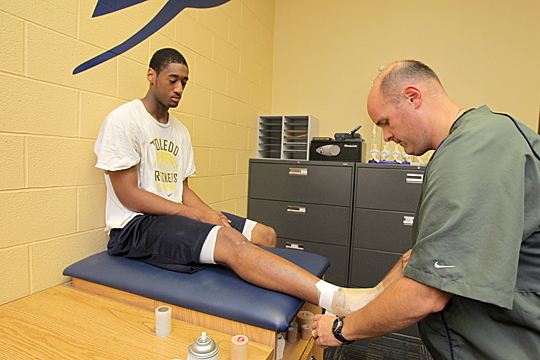 Brian Jones, UT assistant athletic director for sports medicine, taped the ankle of basketball player Matt Smith. March is National Athletic Training Month, and The University of Toledo Athletic Department would like to acknowledge and thank the athletic training staff and highlight their work. Brian Jones, UT assistant athletic director for sports medicine, oversees the highly trained and personable staff members who provide preventative and recuperative care for student-athletes to keep or get them back on the field of play. Athletic trainers are educated professionals with a minimum of a bachelor’s degree who obtain certification credentials, as well as state licensing, have knowledge about the latest trends and equipment accessible through continuing education courses, and are members of a professionally recognized American Medical Association organization, the National Athletic Trainers’ Association. Athletic trainers work with coaches and their teams to personalize preventative and post-injury care specific for the needs of the student-athletes and their sports. In conjunction with the National Athletic Trainers’ Association, the UT Athletic Sports Medicine staff is promoting this month’s theme, “Every Body Needs an Athletic Trainer.” The goal is to raise awareness about the value of athletic training not just for student-athletes, but for everyone. Part of that goal is to encourage a change in legislation and public health and expand opportunities within the field. Another goal is to get every athlete to personally know his or her athletic trainer not just after an injury, but before an injury occurs. Working with Jones to keep Rockets in the game are Gretchen Buskirk, associate head athletic trainer; John Walters, associate athletic trainer; and Kelly Stobba, assistant athletic trainer. The staff also includes athletic trainer intern Robyn Hafner, as well as graduate assistant athletic trainers Mike Alfonsi, Samantha Bowker, Mike Mayes, Sam McMullen, William Saul and Lauren Welsch. In addition, physical therapist Jennifer Miller and administrative assistant Michelle Harris help keep things running smoothly. For more information the National Athletic Trainers’ Association, click here. When people think of science classrooms, they don’t tend to think about sociological theory and multicultural education — but a course at The University of Toledo does. On Monday, April 1, from noon to 1 p.m. in Gillham Hall Room 3100-C, doctoral education student Nithya Doraiswamy will present her research on social foundations for science classroom praxis. The presentation is part of a research colloquium series that takes place every semester. Doraiswamy and her adviser Dr. Lynne Hamer, associate professor of educational theory and social foundations of education, helped redesign a required Social Foundations of Education course for science classroom praxis. They also used input from Dr. Charlene Czerniak, professor of curriculum and instruction, who specializes in science education. The course offered sociological theory and multicultural education frameworks in the context of science education and teacher leadership to create inclusive, equitable and culturally relevant teaching practices for science classrooms and professional development. 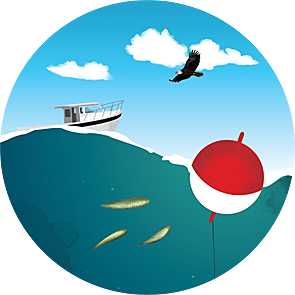 “This course was unique because it aimed to enhance and transform existing science classroom practices instead of just adding to them,” Doraiswamy said. Along with Hamer, Doraiswamy taught the new course last summer through the LEADERS grant funded by the National Science Foundation. They plan to teach the course again this summer, with Doraiswamy using the action research process to reflect on the teaching and learning of the previous class for future improvements. For more information about the presentation or the colloquium, contact Dr. Revathy Kumar, assistant professor of foundations of education, at revathy.kumar@utoledo.edu. 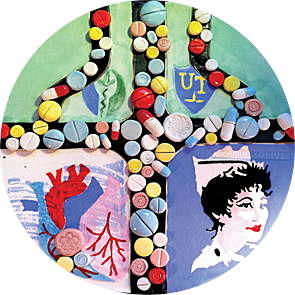 The University of Toledo arts community was among the participants in the internationally recognized “You Are Here Toledo” place-making project. Last spring, 100 dots were placed around Toledo in locations of historical significance. The design of each dot was created as a celebration of its location and a meditation on its relationship with the city. HOW Magazine, one of the leading publications covering graphic design, celebrates 242 of the best design projects of the year in its March issue, the International Design Awards Annual. Of those, 20 were selected to be featured as outstanding examples of websites and mobile applications. “You Are Here Toledo” is one of the recipients of an Outstanding Award and receives a full page in the magazine. More than 26,000 issues of HOW were printed and distributed. In addition to this international honor, “You Are Here Toledo” was selected one of eight projects to be presented at a national American Institute of Graphic Arts gathering in Salt Lake City last year. 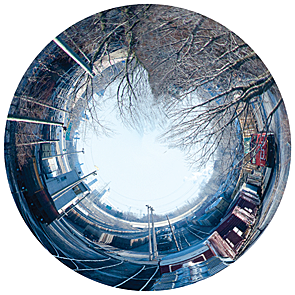 Of approximately 200 artists who entered the “You Are Here Toledo” competition, 100 were selected to design a dot. Nearly 30 of those were UT students, faculty and alumni. 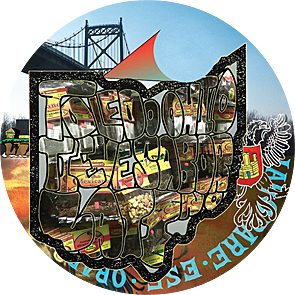 “You Are Here Toledo” was created and implemented by the Toledo chapter of the American Institute of Graphic Arts and the One Percent for Art Program administered by the Arts Commission. 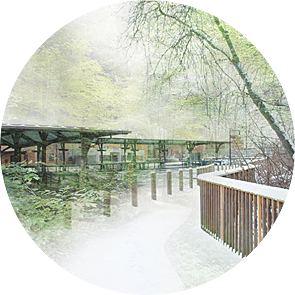 Other partners in the project included Hanson Inc., which created the website and mobile application enabling user participation, and printers Homewood Press and CGS Imaging. The program ran from May through October 2012. The dots now have been removed from their sites around the city. Dan Hernandez, UT assistant professor of art, was one of the coordinators of this project when he worked as coordinator of the Art in Public Places Program of the Arts Commission. An archive of the project can be seen at youareheretoledo.com. • Nik Vechery, the Oliver House.